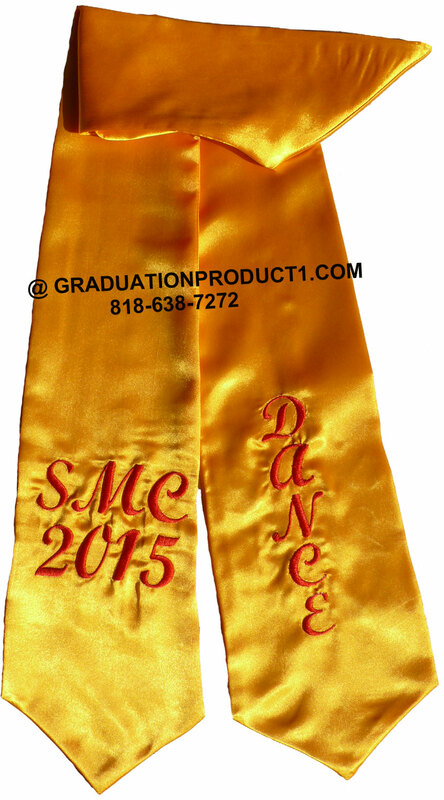 Direct Manufacturer of sashes , Graduation Stoles and honor cords. Processing refers to the amount of time it takes for us to process your order before it ships. Typically all orders will ship within 2 business days from the day the order is placed. How Is Shipping Different Then Processing? After placing your order, we will contact you to finalize your stole artwork. We will need confirmation before anything is manufactured. No logo artwork?Not a problem! After you place your order our team of designers will work with you to craft a beautiful stole. Gold Two Side Embroidered Graduation Stole are our most popular seller in this category. Ordering Process: Select Stole color from Dropdown box and Enter thread color of lettering and personalization text or Greek letters. You can also email us your design later with your order number at sales@graduationproduct1.com. No Setup Charge. Start customizing your graduation stole. Pick your color of stole from drop down box, and then write down embroidery color what you want embroidered (such as "Class of 2015" and your Organizations name in special instruction box. You can also Email us images and other details. The amazing low priced, embroidered graduation honor stoles are stylishly made from light bridal satin and shaped to fit all body types. Fully lined throughout the high school / University graduation stole measures 30.5" long each side and 5.25" wide and has neat arrow pointed edges. Graduation Product is happy to offer the amazing discount high school / University graduation honor stoles to celebrate your graduates achievements. Check out the huge savings when ordering in bulk. Customer Reviews on "Gold Two Side Embroidered Graduation Stole"
I wanted to make my honor students feel special so i decided to order Graduation Stoles for them. This product was of great quality and made my honor students feel special. I cant wait for next year so i can order again. Our school was very happy with our purchase. Found out last minute I had to order an Graduation Stoles for my college graduation, which is June 10. Placed the order late amazingly received within 2 days. I'm graduating from University of Houston. The Graduation Stoles I ordered is the PERFECT color, and the perfect length. Nice quality as well. Thank you so much for giving our honor students an added touch of elegance to their graduation attire. We purchased your Graduation Stoles and couldn't have been happier. We wanted a special way to make our honor students really stand out from the other students. Since we had such a large graduating class, your Graduation Stoles, so shiny and bright, made our honor students easy to pick out in the crowd. Our school was very happy with our purchase. This was the quality we hoped for, not cheap looking at all. Just hung it up to straighten out a few kinks from packaging and shipping, which worked, received within 2 days, and it was great! Looks great! Great price. I received the Graduation Stoles in one day. If your looking for quality, this is a great buy! Beautiful, rich looking color and quality. Perfect to represent a high achievement. I was proud my daughter earned this for her hard work. This product works well for what I bought it for. The item shipped in a timely fashion and it fit. Ordering the product was easy and straight forward and I received the Graduation Stoles within a 2 days and they looked really good. The product quality was great and my order was delivered fast and was exactly as described. Write you own review on "Gold Two Side Embroidered Graduation Stole"
Coupons & Exclusive Offers:Sign up to our Email list to receive order discounts, announcements & more! Download our free Apps from store! © 2018 GraduationProduct1.com All Rights Reserved.